Thanks I will try this. I am trying to use use the ros driver gscam to do this. @ppoirier and @tiffo I don’t know if all the step delineated by @ppoirier will become video tutorials anyway I will be available to provide further details. I’am using a dedicated router as access point, with only my desktop PC on ethernet and the Raspberry Pi as WiFi client. From my test this configuration gives less latency then that in which the Raspberry Pi is configured as access point and the desktop PC connect via USB-WiFi device. rotation=180 is due to the way my cam is mounted and the other parameter serves to have fixed value for exposure and gain and high contrast that gives a better marker detection. This gives me a delay on near 80ms. Would it be possible to run aruco board detection on the RPi (or different small companion computer) onboard the quad? it is an interesting thing but is a little bit different from what I have done in my system. if I understood correctly you would like to capture, process and stream the video directly with OpenCV without using the ROS and I have no experience in this. This thing could be done with ROS using usb_cam or gscam to capture, cv_bridge to convert ROS images into OpenCV images, and vice versa and gscam to stream using gstreamer pipelines. Not using Raspberry Pi 0, the one I use, maybe using Raspberry Pi 3 but I have not tested. In my system I have tried to do all by using minimal and cheap hardware, so I use my desktop PC to do more heavy processing. This anyway has the advantage to simplify the testing of other visual pose estimation package. Working on PC is way more easier and speedier then working on embedded board. Is the RPi 0 mounted on the quadcopter. And if it is mounted on it, would it be possible to use it fully as the receiving end with OpenCV installed on it so it can send the commands wirelessly back to the quad? Yes the Raspberry Pi 0 is mounted on the quadcopter. On first post is all explained. The Raspberry Pi 0 has not enough computing resources to do the pose estimation on board (at least with the method I am using) so the pose estimation is done on desktop PC and then the results is transmitted to the quadcopter. Now I am doing the same thing but on a slightly bigger quad (160mm) with a Raspberry Pi 3 on board. In this way I am able to do all the calculations stuff on the quadcopter without using the desktop PC, I am using it only for visualization with rviz. When I organize better all the steps I will post all the info relative to this new setup. However, during the test flight - which is a straight rise to 1 meter and then landing - the following strongly fluctuating behavior was experienced. I have a Pixhawk 4 controller with Arducopter 3.7.0-dev stack. The camera is a raspicamera v2. But I realized that i don’t get any data from /mavros/local_position/pose. Does anyone have any idea what can cause this problem? Hello @ptroll, is it possible to have the logs of this flight ? Hi @ptroll I would like to see the output of rostopic list after the launch of mavros. @ptroll sorry, I would like to see also the output in the terminal in which you launch mavros. I can’t find the reason for this. Does anyone have any tips on where the error might be? What should i modify to get messages from local_position topic? Maybe something in apm_config.yaml or apm_pluginlists.yaml? 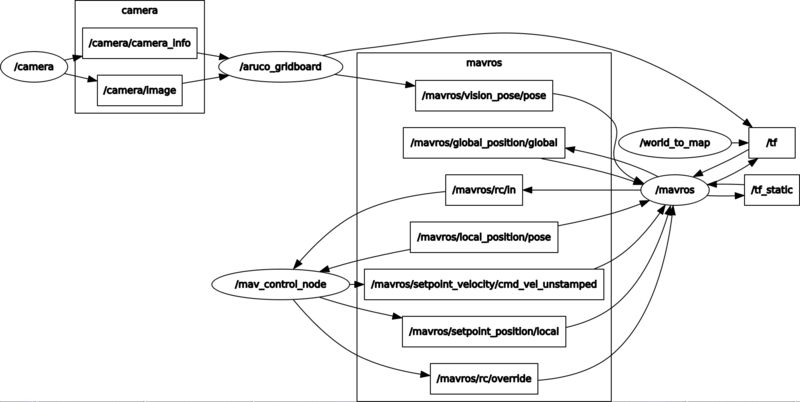 The local position is internal to the EKF on ArduPilot, there is not external position estimator , so mavros is basically just used to transform ENU to NED references. You can still use the tools for mav control. Just an idea, but if you are using the branch Copter-3.7.0-dev stack, maybe you should use a “released” branch like Copter-3.6.7. This one has the external navigation feature, and you are sure to not suffer from any bug appearing during development. Also, it can happens that some topics (maybe /mavros/local_position/pose is part of it), need a frequency parameter to publish. Not sure, but I had a bug like this once. I use the service rosservice call /mavros/set_stream_rate 0 20(Hz) 1 for this.